designation from the New York Times. 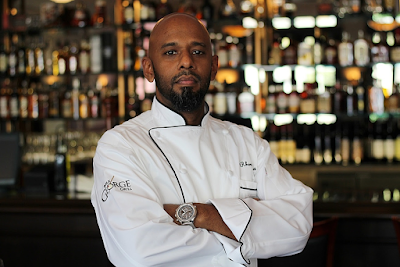 We took a look at the menu and were intrigued by Executive Chef Carlos Buscagila take on traditional Italian cuisine in a very modern , sleek atmosphere. cocktail before dinner or a glass of wine and great conversation. Oregon paired with a seven course dinner. Karen and Jim Bergstrom were there from Bergstrom Wines. Actually, to quote Sommelier Julia Moretti, " This all started with a glass of Bergstrom Pinot Noir a few years a go ". It was well worth the wait. Jim featured the Bergstrom "Cumberland Ranch" Pinot Noir 2006 and his Bergstrom " Dr Bergstrom " Riesling 2006 during the dinner. Laurent Montalieu winemaker/ proprietor of Solena Cellars was also in attendance and the dinner featured his Solena , Pinot Gris, 2006 and the Solena Pinot Noir 2006. Showing off her wines was Debra Hatcher, Executive Vice President of Sales and Marketing for A to Z and Rex Hill Vineyards and Winery. She was featuring her A to Z Pinot Gris 2006, A to Z Pinot Noir 2006 and for one of the most interesting pairings of the night the Rex Hill "Unwooded"
Chardonnay 2006 and the Rex Hill " Dundee Hills" Pinot Noir 2006. Pinot Gris 2006. This pairing was right on with the wine pairing nicely with the Salami, Proscuitto and all the Traditional Accompaniments. Next we enjoyed the Solena Pinot Gris 2006 with a Tuna Belly Crudo with Cremini Mushrooms. We were just getting started when we had the first Pinot Noir of the night with a Beet salad. The A to Z Pinot Noir 2006 blended nicely with the beets and drunken goat cheese. We spotted the next pairing when we first saw the menu a few days prior to the event. We looked forward with anticipation to the pairing of Rex Hill " Unwooded" Chardonnay 2006 and Rex Hill " Dundee Hills " Pinot Noir 2006 with Seared Diver Scallop and Braised Short Ribs. As we suspected, it was a memorable pairing with this dish. Both wines paired well with the Scallop and the Braised Short Ribs and they changed on the nose and palate to compliment each dish. Ravioloni , a short rib raviloi with barbara wine reduction, was combined with a spectacular Pinot Noir from Solena 2006 vintage. We were just past the half way point and each of the winemakers took turns with Chef Carlos in explaining the pairings. We were finally ready for the last course, a wonderful Panna Cotta with strawberry and mango and a Riesling reduction prepared by Pastry Chef Nika Yazdani. Bergstrom " Dr Bergstrom" Riesling 2006 was a nice contrast to the very sweet desert. Vino Las Vegas enjoys the great wine and food at the 26th annual Santa Barbara County Vintner's Festival in Lompoc Ca. The Festival was originally held at the Mission Santa Ines in Solvang. This first event featured 17 wineries and at the time there were less than 7000 acres of vineyards bearing fruit. over 90 wineries along with many local restaurants and caterers. In 2008 Santa Barbara County has over 20,000 acres of vines. This is a far cry from the event held 26 years ago. stands out for us, the camaraderie amongst the member Vineyards. and the vineyards are awakening from their winter sleep. Wild flowers are everywhere producing roadside shows of yellow, blue , pink , white and purple. Each year the Festival out does it self and this year was no exception. With some of the best Pinot Noir and Syrah in the country accented with varietals like Sauvignon Blanc , Viognier and Marsanne how could you go wrong ? You cant ! or more restaurants or caterers showing off their expertise. If you have never been to this area or you are a long time visitor, The 27th Annual Santa Barbara County Vintner's Festival is going to be worth the visit. We plan to be there in 2009 and hope you see all of you ! Buttonwoods 39 acre vineyard stretches across the rolling hills of the Santa Ynez valley. The entire property includes about 106 acres that include the vineyard , winery , tasting room , a pond and peach orchards. Its is a true farm in every sense of the word and is busy all year around. Sauvignon Blanc, Semillon, Marsanne, Merlot, Cabernet Sauvignon, Cabernet Franc, and Syrah . These Bordeaux and Rhone style wines grow well in the eastern Santa Ynez Valley. We had met winemaker Karen Steinwachs at the World of Pinot Noir. She really impressed us with her passion for winemaking and decided to stop by when we were in Santa Ynez. Karen is not a newcomer to the business. She started at Foley for a six week harvest job that turned into three years. During this time she developed her passion and never looked back. landed at Buttonwood as their winemaker and what a great fit it seems to be. the way to the "top" we passed a beautiful pond near the winery. orchards streached out below us. From this vantage point we could see the Santa Ynez valley and many of the vineyards. That is a view that we will not soon forget. We spoke with Karen on top of the Mesa as she explained her winemaking philosophy and showed geographic landmarks of the valley below. As we spoke to her , you could see the love and passion for what she does. We headed down for a look at the winery and to taste some of her wines. We started off with the Buttonwood " Zingy" Estate Sauvignon Blanc 2007. The nose on this refreshing wine jumped out at us and the palate came through with citrus and classic Sauvignon Blanc overtones. This little " Zingy" really surprised us and would be perfect on a warm sunny day. We have had many Sauvignon Blancs and this one is right in there with the best. We also tasted the Buttonwood Trevin which is Buttonwoods proprietary name for their Merlot, Cabernet Franc and Cabernet Sauvignon . The blend on the Trevin can change with each vintage as Karen uses a blend that showcases the best elements of Trevin's three components. This is a great food wine and only has a production of 486 cases. Buttonwood even produces a Cabernet Franc. Buttonwood Cabernt Franc Santa Ynez Valley 2003 is another one that stood out for us. On the nose the spice really came through and on the palate as well. Buttonwood even has a "Franc Fest" every year to show off this incredible wine. With only 313 cases produced this is one to jump for. We enjoyed our visit at Buttonwood and the opportunity to spend time with Karen. She took us on a tasting tour of most of the Buttonwood wines. They were all very special. 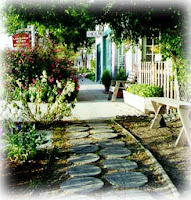 If you are in Santa Ynez stop by and say hello to Karen and her staff. To learn more about Buttonwood you can go to http://www.buttonwoodwinery.com/. known in the wine industry and we spoke with her her about how she got started making her wines and her future plans. Pepe is only open by appointment and the wines are allocated . house we were honored to attend and take our worldwide readers with us. Clos Pepe is a family-owned vineyard and winery set in the heart of the Santa Rita Hills of Santa Barbara County, California. They have about 29 acres planted in vines. 25 acres are planted in Pinot Noir, and 4 acres in Chardonnay. Pinot Noir is what Clos Pepe is know for and make about 800 cases of Estate Pinot Noir each year. They also produce about 100 cases of Chardonnay that is aged without the use of any new oak. The vineyard is well known sell grapes to other wineries. Wes believes that great Pinot Noir and Chardonnay is an expression of hard work in the vineyard and was named Central Coast Winegrower's Association Grower of the Year 2001-2002 and is also the winemaker. burning oven where they were making custom made flat bread pizza at pool side. a well known winery and many vineyards purchase fruit from them. The Clos Pepe 2000 Chardonnay has held up just fine as well as the 2000 Pinot Noir. Wes and Clos Pepe have an fantastic website that can be found at www.clospepe.com You can watch a great video presentation about his winemakeing and the vineyard. We raise our glass of Pinot and say Cheers ! to Wes, Chanda and the entire Clos Pepe staff for a job well done. in store for us each year. Barrel tasting is the best way to compare the past vintages and current releases with the next vintage that is 'in the barrel". Many of these wines can be in the barrel for 15 months or more. Watch as we join vineyard owner Peter Work barrel taste Ampelos cellars Syrah , Pinot Noir and Grenache to see how they are progressing. Elaine from Vino Las Vegas made a stop in Los Olivos one afternoon to taste some wine and enjoy some art. Symphony , Peak , Desert Blush and white Merlot were well known to the winery's visitors. would become their first estate Red Wine. history books were about to be rewritten. The first commercial estate bottled Red Wine in the State of Nevada was bottled at the winery. As members of the Press and bottling crew watched, Bill placed the first bottle of Nevada Ridge Zinfandel 2005 "First Crush" into the Fill machine and corked the bottle. A large round of applause filled the room and history was made. Bill 's wife and winemaker Gretchen took his side and signed the bottle. And thus bottle number one was made. The bottling crew took Their places and the line began in full operation. The entire production of 1200 bottles was in full swing. The first commercial estate grown Red wine in Nevada History was now in production. Bill offered Scott of Vino Las Vegas the opportunity to bottle his own piece of Nevada History and Scott jumped at the chance. Vino Las Vegas is proud to have been a little piece of Nevada Food and Wine History. Once inside the winery you could even think you are in a tasting room in Napa valley or the Central Coast. Their Zagat rated gourmet restaurant Symphony is open for lunch and dinner, offers fine food served in an atmosphere of quiet elegance, at reasonable prices. Symphony have been given rave reviews by food critics and travel writers countrywide. Pahrump is located about 1 hour from Las Vegas and well worth a visit for Lunch , Dinner or just stop by and say hello. We here at Vino Las Vegas would like to congratulate the Pahrump Valley Winery and its staff for a job well done. We know this is the first step toward many good things to come. If you like Pinot Noir the place to be April 21 is Fiamma Trattoria and Bar inside the MGM Grand Hotel right on the Las Vegas Strip. This promises to be an evening to remember. A Seven course dinner with each course paired with some great wines. 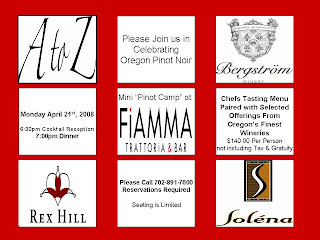 This dinner will feature Oregon Pinot Noirs like A to Z, Bergstrom , Rex Hill and Solena . As you work your way through this magnificent menu that features Italian Caviar, Foie Gras and Seared Scallops talk to the winemakers about their 2006 Vintage and of course their Pinot Noirs. . They have even brought along a few other wines to surprise us with. 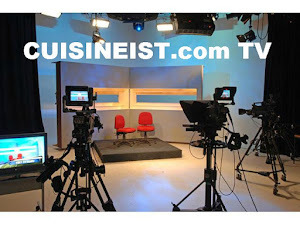 Vino Las Vegas will be there to cover the event and enjoy the great Food and Wine so by and say hello ! largest single day wine tasting event. The Paris Hotel and Casino hosts this renown tasting in it's Paris Las Vegas Ballroom. Last year for UNLVino 2007 8,000 guests sampled 1,100 wines from more that 350 wineries from all over the world. UNLVino has grown into not just a wine tasting event but a live auction as well that includes trips, art, golf and much more. for the live auction which gets bigger each year. to help raise money for the students at UNLV. Southern Wine and Spirits has made this event a world wide phenomena Were wine experts and novices come together from all over the world to enjoy the great City of Las Vegas, taste some renown wines and most importantly "Take a Sip for Scholarship." This event is about education as well. Southern Wine and Spirits Master Sommelier Louis DeSantos gave Scott from Vino Las Vegas quite an education on Sake. The second event of UNLVino 2008 was AUSS-SOME AND THEN SOME ! held at The District at Green Valley. This is the only UNLVino event outside and what a perfect evening it was. names as PF Changs and the Cheesecake factory. "big name" shops as you enjoy sipping on a cappuccino . shopping with their "family" members. them apart and makes each wine unique. AUSS-SOME AND THEN SOME 2008 was a great success in our opinion. We attend many events throughout the year and look forward to AUSS-SOME AND THEN SOME every year. Come along with us as we take you inside this years event.